Create the best version of yourself. A NU YOU. With this product, you earn 15 loyalty point(s). 15 points = €0.45. If you return us the products in original, undamaged packaging within 14 days, we will give you a refund. Call us at +386 (0)30 709 409 for more info about our products. Are you ready to start creating a nu you today? nuMe Slim Soup with Collagen Garden Veggies is an innovative nutritional solution specially designed to help you cope with moderate and severe weight problems. 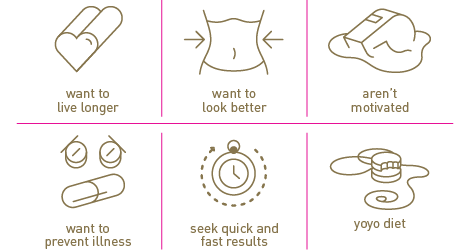 Packed with all vitamins, minerals and other essential nutrients your body needs to support healthy weight loss, it can be used as the sole source of food in a very low calorie diet (<800 kcal). 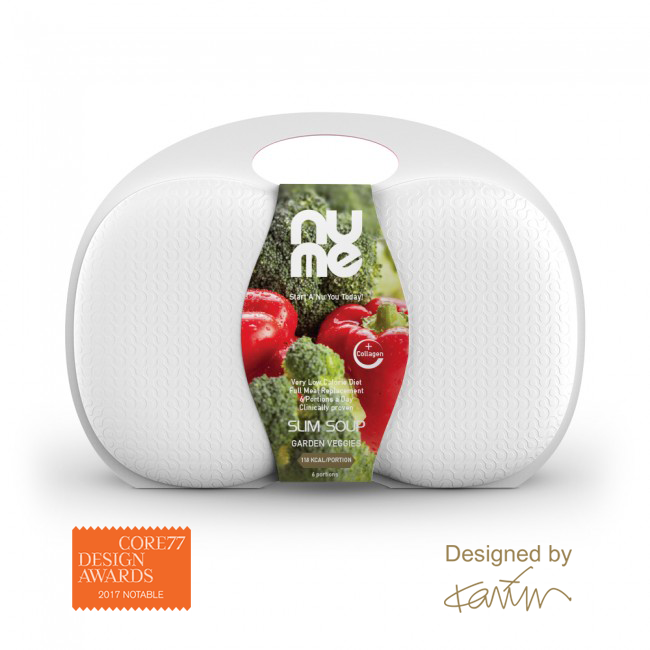 Developed by doctors, personal trainers and nutritionists to promote both health and beauty, nuMe Soup with Collagen Garden Veggies combines efficient weight loss and comforting indulgence of warm nutritious soup, making it a perfect choice for modern women. 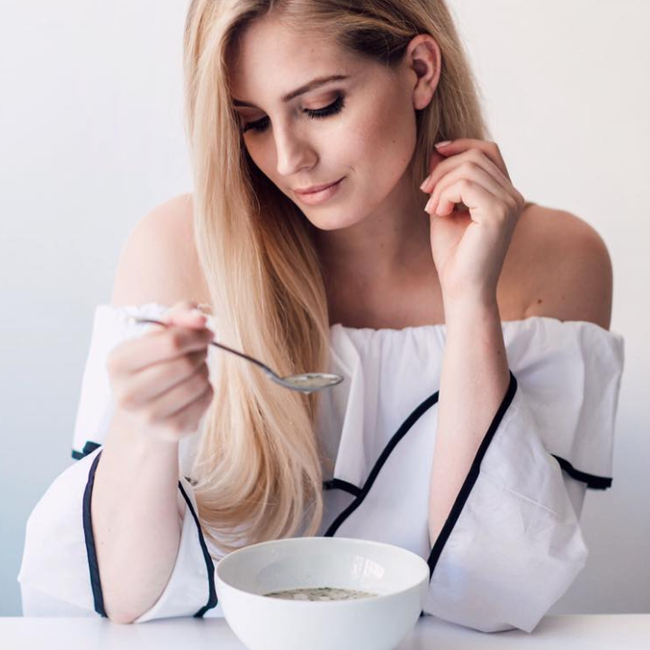 A delicious soup that warms your soul and is prepared in a matter of seconds is the perfect solution for every busy modern woman. nuMe Slim Soup with Collagen Garden Veggies is a low-calorie food replacement that provides a special treat for your taste buds – the delicious flavours of colourful vegetables that grow in our home gardens. 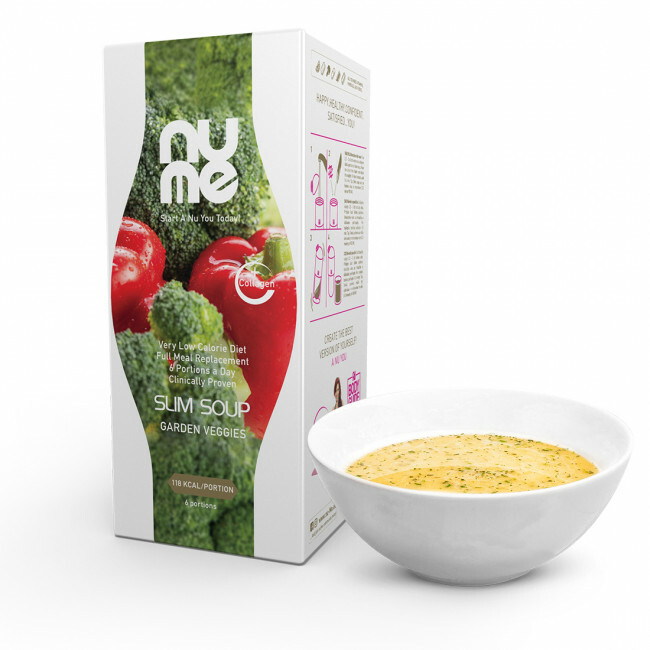 A daily menu of 6 smaller portions helps you adapt to a completely new way of eating and shrinks your stomach, so nuMe Slim Soup with Collagen Garden Veggies changes your eating habits for good. 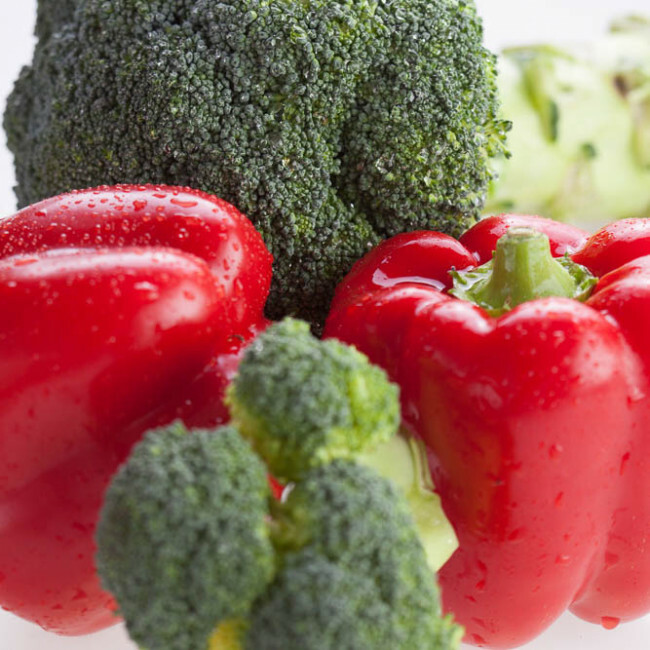 Whenever you decide to go back to a more traditional diet, you will find it easier to limit your meals and maintain healthy weight. 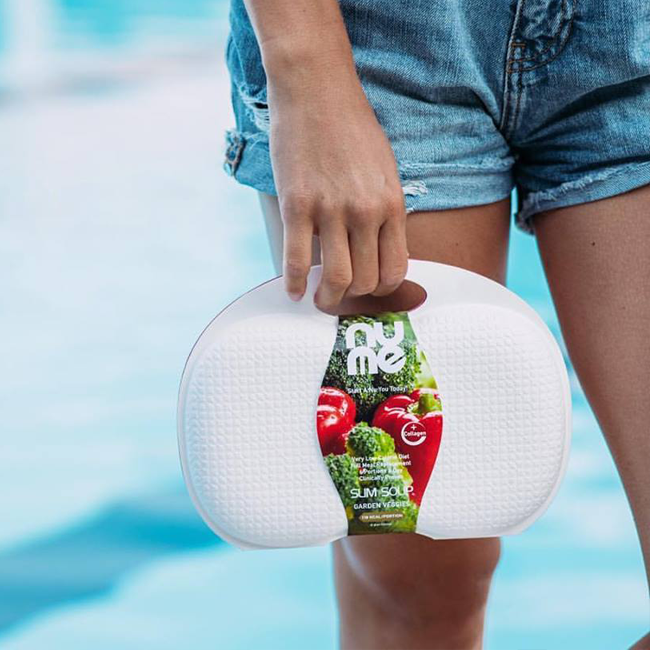 With its high nutritional value, low calorie count and enough protein to help you maintain your muscle mass, nuMe Slim Soup with Collagen Garden Veggies can replace all your daily meals, paving your way to a nu – slimmer, healthier and happier – you. 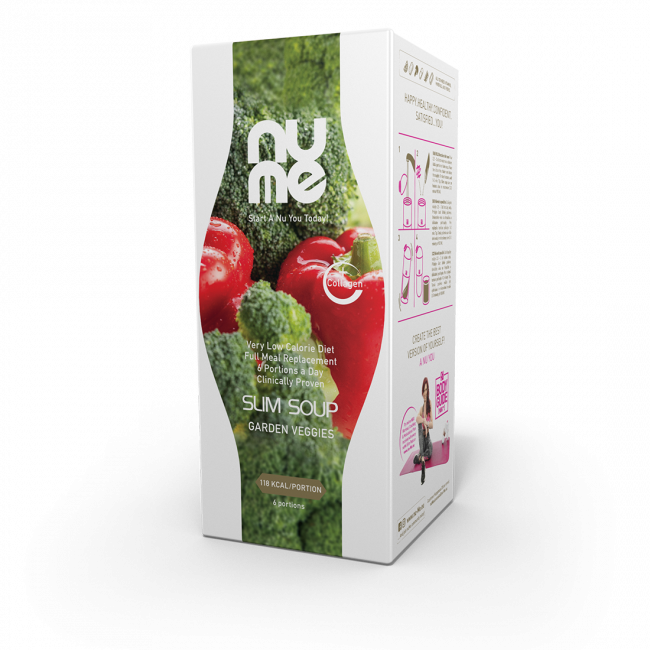 nuMe Slim Soup with Collagen Garden Veggies can be used by most chocoholics who want to lose excessive weight and enjoy a healthier lifestyle. The product is not recommended for children, young people, elderly people, pregnant women and people allergic to soy or milk. 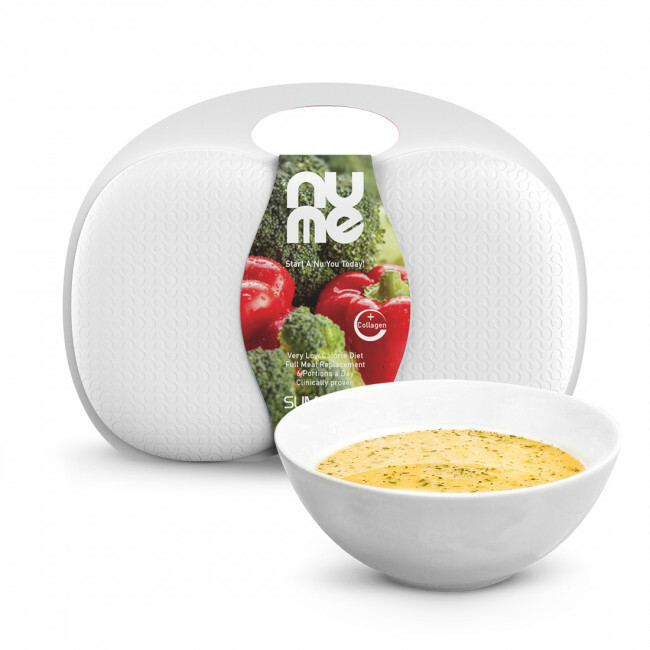 All you need for a tasty shake is one serving of nuMe Slim Soup with Collagen Garden Veggies mixed with 250-300ml of water in a stylish nuME shaker/water bottle. 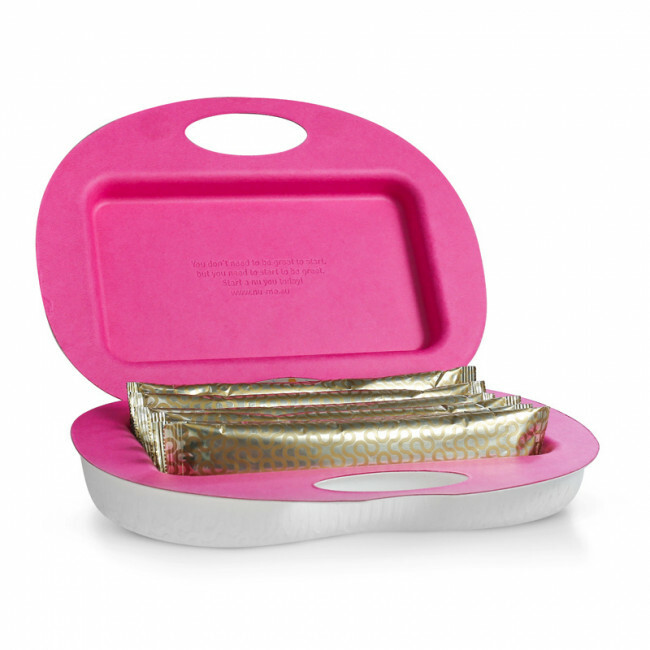 6 servings ensure that your daily nutritional needs in a VLCD (very low calorie diet) are fully met. INGREDIENTS: Soy protein isolate, modiﬁed potato starch, inulin, emulsiﬁer soy lecithin, hydrolyzed collagen (5,1%), carrot pieces, maltodextrin, ﬂavour, vegetable powder, milk protein, herbs, whey protein, spices, colouring agent beta-carotene. **MINERALS: Potassium, sodium, chloride, magnesium, calcium, zinc, ferrous, copper, manganese, iodine, chromium, selenium, molybdenum. INSTRUCTIONS: Always remember to drink plenty of ﬂuids while dieting, preferably 2-3 liters of water a day. It is recommended that this product be used under medical supervision. When using the nuMe slim shake as the only source of food, it should not be used for longer than 3 weeks without medical advice. It is also recommended that pregnant women, children, young people and elderly people do not use this product. With 6 portions of nuMe slim shake per day, your nutritional needs are fully met. It is important to eat all 6 portions of nuMe slim shake. 100% Satisfaction Guarantee: If you return us the products in original, undamaged packaging within 14 days, we will give you a refund.